"'ne me quitte pas and 'le plat pays'; www.last.fm/music/jacques+brel are two songs by belgium's most famous non cycling son jacques brel ( author-composer). so, what has this got to do with these super cool/very warm bkw belgium knee warmers? memories - in the winter of 1983 I was in antwerp and my bike came too. i joined up with some guys from the local club and we went riding. 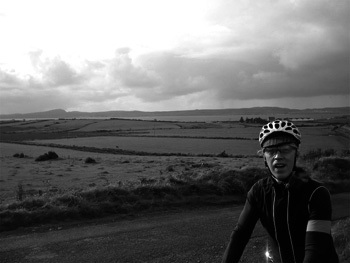 hard riders, cold weather, and we all rode fixed. it was bitter and windy - not quite as windy as Islay - but just as unrelenting. we headed out from the suburbs to st niklaas across the schelde to mechelen and then waterloo taking in several cobbled climbs and wee routes, although it was a regular training ride all i remember are two things; a bunch of rouleurs in woollen shorts and secondly, hanging on for all i was worth. i cannot remember if we even stopped in a cafe to eat/drink but i do still have immense respect for these guys with the ultimate souplese. on my return my landlandy plied me with waffels and warme schocolade. lifesaver. then 25 year later rapha release the story of bkw (bare knees and loads of embrocation) and that smell of of liquid warmth returned and filled my nostalgic nostrils. 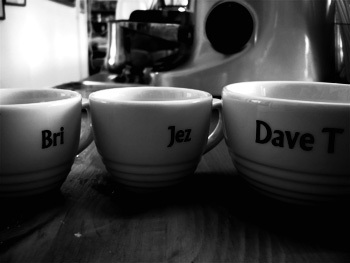 these are, as all rapha products, well thought out, exquisitely made and comfortable. they even have a right and left cut. also, even more impressive, is the removable label so no chafing on delicate winter skin.my only gripe is: why has they taken 25 years to get here? in use you would not know that they were there. it is autumn here, it began on wednesday, with wet leaves on small roads, squalls pushing across the atlantic and cold winds testing us all we went out riding. me, bp and the bkws. warm knees or what? for some the white maybe too clinical however they certainly made me obvious through the murk on such a driech day. and so, back to the beginning - 'le plat pays' - 'the flat lands' is so apt and so evocative of time spent in belgium and 'ne me quitte pas' - 'do not leave me'...well... these white warmers with the belgium colours facing forward, and a subtle bkw motif on the rear are here to stay. 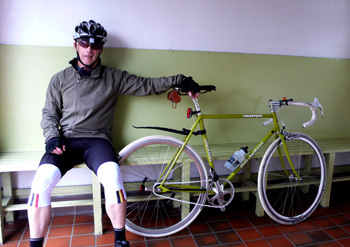 25 years later i still do not own a pair of cycling tights." do you remember the bit in the movie independence day where the combined might of the american airforce is heading towards one of those enormous flying saucers hovering over washington or new york (i didn't have time to watch it again to check)? the aliens contained within haven't exactly been too pleasant to the human race at this point, having blown up a helicopter sent with one of those we come in peace messages, resulting in the airforce attack mentioned above. unfortunately for the usaf, the flying saucer thingy has a rather nifty force field that prevents the thermo nuclear missiles from doing any damage at all. bummers. well, joy to say, one of those force fields is now available to cyclists across the world, and it says rapha down the middle back pocket. and not just an ordinary wow, but one of those wows that knocks you back on your cleats for ten minutes leaving you with a 'what just happened here?' buzz in your head. there are gilets and there are gilets, but this is something different altogether - yet it's still a gilet. made from the same fabric of which rapha's world famous classic softshell is made, the softshell gilet leaves no detail unturned and no feature excluded. the high collar is lined with tricot and has the trademark tiny flap to stop the off centre, full length zip from nipping your neck. however, in the first sign of the consideration that has gone into this item, while the collar is high at the front, it dips towards the rear, making for a more comfortable experience when on the hoods or drops. there are two pink drawcords at the hem, available to pull in the tail flap to keep the bum dry and warm(er). and though it's a well known fact that i don't get out much, i've never seen a gilet with three rear pockets; this one is no exception - it has four. the two outside pockets are scalloped downwards for easier access on the bike, the centre pocket is narrow to hold a pump, there's a zipped pocket for a debbie card or real money, and there's a small, zipped pocket hidden in the seam at the left side. the centre pocket is rubberised at the top on the inside; this to allow the fastening of a flashing red light without causing undue stress on the fabric. art lies in the detail. while i am not generally in favour of wearing an ipod while cycling, i realise that some are. in the latter case, one of the rear pockets has a small stitched eyelet to allow the headphone cable to exit. but it doesn't stop there - on the left inside of the gilet, are four pink loops through which the cable can be threaded to stop it snagging or getting in the way if the gilet is left open. there are three principal necessities required of cycle clothing: it has to do what it says on the tin; it has to look good; and it has to make you feel comfortable and stylish on and off the bike. the latter may seem a bit trivial, but if you think about it, how much more comfortable and confident do you feel on your bike if you know that the clothing you're wearing exudes quality? i rest my case m'lud. on the first two points, the rapha softshell gilet simply cannot be faulted - the size tested (medium) fitted like it was custom built and i'm sure john herety will offer me a rapha condor contract for 2009 purely on the basis that i looked like a winner before i'd even made it to the bikeshed. as luck would have it, the days set aside for testing were suitably crap: the weather was cold, windy and bearing frequent heavy showers. i wore it over rapha's new cross jersey (the brown and orange one tested on the post only a week or so ago) which is made from the same sportwool as used in the lightweight summer jersey. i chose this because this fabric is not quite the most apt to wear uncovered in such weather, but since the gilet would be covering my body, leaving the arms to fend for themselves in the elements. true to form, the poor wee arms could only chill out (bit of an understatement) while the rest of my torso remained cosily warm. and at the risk of being typecast, i really do like cosy. further adventures in cold, wet and windy did nothing but reinforce first impressions; the rear pockets really are a boon, making it much easier to grab a jam sandwich while riding, rather than desperately trying to access a jersey pocket without undoing the zip. flapping in the wind is a phrase totally foreign to this gilet which, considering the 10km into a headwind in a desperate quest for a double espresso (did i ever tell you that we have personalised cups at debbie's - that's how gauche we really are.) was a boon worth experiencing. and since i often find that it's the arms that get all swot and hetty when wearing a full metal jacket, having both limbs covered with only long jersey sleeves adds much to the comfort of being buffeted by a 40kph headwind. don't you just love this time of year? it's half past autumn/fall, going on winter. get one now. almost exactly one year ago, brooks saddles or, to be more precise, extrauk, supplied me with a brooks swallow racing saddle to fit atop the carbon seatpost of my colnago c40. with saddles having reached the same degree of technology as the rest of the frame - clearcoated raw carbon fibre anyone? - it seemed like the perfectly responsible thing to do, testing the old against the new. as has been mentioned in passing more often than once, cyclists - or at least a subset of the fine body of people who respond to that apellation - have a tendency to be obsessed with weight. sadly, this often doesn't extend to themselves, but merely to the components hung on the previously mentioned carbon. there is a double logic to this: the less the bicycle and fripperies weigh, the easier it is to ride uphill, and the more can be spent on stuff that none of us really need. but if you're studious about this, and check the weights of a variety of saddles from differing manufacturers, unless you're a really dedicated weight weenie, the number of grams separating the best of the rest from the best of brooks is not particularly alarming. to recap, for those who didn't read any of my subsequent reports on the effectiveness of the brooks, after readying my posterior for the weeks of agony that it was sure to endure until either the saddle relented or my bum did, it was a major disappointment to discover that the pain and suffering failed to materialise. in short, this is probably the most comfortable saddle it has been my pleasure to sit on. so much so, that i took it with me to london, and fitted it to the merckx that i rode all the way to paris. i laugh in the face of paris roubaix cobbles. so, one year on, how has the saddle faired amongst the north western wind, rain and being left out against the wall at debbie's? darned well, is the easy answer to that question. it's two failings have encompassed one aesthetic and one that really doesn't have anything to do with the saddle at all. if you have a squint at the illustration accompanying this article, you can't but notice the long nose (the swallow is a close replica of the first racing saddle produced by brooks in the 1930s) which is, to its subsequent detriment. while there is a fold over flap under the centre of this long section, joined by a rivetted steel panel, it is rather a long piece of leather to be physically unsupported, and this has resulted in the top of the saddle flattening out somewhat. i did speak to someone from brooks about this and they admitted that it is a concomitant failing of this model. however, it has made no difference to the comfort, possibly even enhanced it in the process. 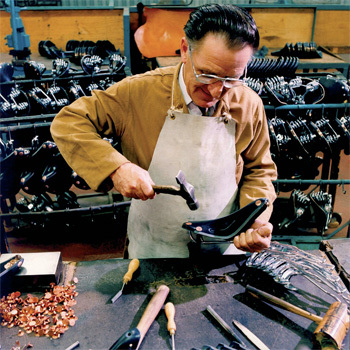 the second point is exactly that; colnago insist on a two bolt fixing for saddles on their own seatpins, and, unless you can fit the saddle within a limited setback, the front bolt either rattles on the steel plate, or pushes a little blip on the leather. not brooks' fault and again not a real problem, but aesthetically a bit dubious. so even if you are the proud owner of a top of the range something or other, you need have no fear of fitting a brooks saddle and being comfortable with your pride. all those trendy supersonic shaped perches with carbon rails and the like may well be fine for many, but a brooks is where it's at. 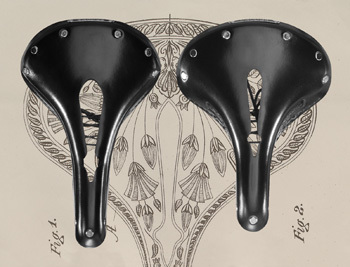 recent and not so recent articles concerning the perineal pressure exerted by a fairly rigid saddle, have encouraged a current spate with cutout sections to remove this potential discomfort. and the removal of material in this area is generally regarded as a relatively recent development in bicycle anatomy. not so: brooks have discovered, while trawling their considerable archive catalogue material, that they had offered this relief by way of cutouts in their leather in the 1890s, some 100 years before any other manufacturer. this has resulted in the company offering the new brooks imperial saddle with cutouts in both male and female versions. so if you've held off on a new brooks saddle, timorous at the thought of undercarriage hurt, this new offering may be the very excuse you needed to finish off the bicycle in the manner to which it would like to become accustomed. nothing new under the bum. one question regarding the newly produced brooks bugle newspaper: why are nearly all the letters from american addresses? do us british people not write to brooks england? now i'm not proud of this, and i've had several concerns over telling you this in the first place, but since i figure it happens up and down the country, and i'm no different than anyone else, what the heck. headsets: the fitting of; i'm talking here of the standard, beloved of thewashingmachinepost external headsets, because i'm not that sure how you go about plugging in one of those integrated thingies. every now and again, these things need to be replaced, particularly if you are of a rural location that requires regular cycling across cattle grids on a frequent basis. it plays havoc with the bottom bearings, and agricultural waste has an uncanny knack of finding its way into the most obscure nooks and crannies. so, if we accept that you (me) live nowhere near a 'proper' bike shop, how does one go about replacement of the offending headset? and here we go with the admission that i'm not proud of: using a big screwdriver and a hammer for removal (well, it's not as if i'm going to re-use it) then a couple of chunks of wood and the same hammer to fit the new one. i'm sure you can see the fundamental flaws in this process. it's the sort of process (if that isn't giving it too much aggrandisement) that can almost be got away with on a steel frame, since that's a material that is quite hardy and tolerant of large bladed screwdrivers being hammered into its interior. aluminium is considerably less so, and carbon fibre lets out a loud scream if you even think of lifting the screwdriver off the toolboard. and i should also point out at this juncture, that very lightweight aluminium headsets can be damaged quite severely by a swift blow with a hammer on a block of wood. but then i doubt i'm telling you something that you don't already know. so, having endured several years of delaying the inevitable, when it came time to fit an expensive chris king headset to a carbon fibre colnago, i bought a headset press. why had i not bought one before? most of these tools are designed for workshop use, where they are gainfully employed probably most days of the week, so £120 is probably mere petty cash to lay out when the returns are likely to be at least justifiable. however, £120 is quite a lot of money to pay when the chances of the tool being used more than once a year are fairly slim, and this is quite true of a number of bicycle workshop tools. working on expensive frames is a scary business which can be made slightly less so if the tools are of a quality that is likely to lessen or completely eradicate the possibility of damage to said frame (the same cannot be said of blocks of wood and hammers). since the workshop market is hardly enormous and such tools a fairly specialised, the price for each is often quite substantial, making it infinitely more economic to take your favoured bike to the local bike shop and have them carry out the work. but quite a number of us are nowhere near a local bike shop, and the cost of transporting frame to shop in these instances can be quite prohibitive. the advent of a new range of workshop tools from cyclo (uk) means that the cost of purchasing a tool to carry out even the most sophisticated frame job has suddenly entered the realm of the average, non professional. i was able to acquire a very fine headset press from cyclo for around £30 - a quarter the price i thought i was going out of my bank account. and the new range of tools just released in time for the earls court cycle show seems even better, judging by the examples i got to play with on the weldtite stand. mitigating against this, however, is the fact that just because we can now afford these, doesn't actually provide us with the skill to use them properly. would you know how to face and ream the head tube, or come to that, the bottom bracket shell? and in the age of carbon fibre, do you know whether you're supposed to? much like a lot of things these days, some are best left to the professionals who know how to use their now more economic tools. it doesn't have to be left at that: there are many accredited cycle mechanics courses the length and breadth of the country (ok, there aren't any on islay, but it's the principle of the thing) if you feel like taking matters into your own hands. 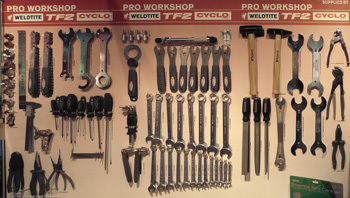 if you already are a professional level bicycle mechanic, cyclo tools have not only made many tasks easier, they've placed most of it within the financial reach of most. of course, you don't have to acquire the serious end of the tool world; there is a great deal to be said for owning a quality set of spanners, screwdrivers, files, pliers, cable cutters etc., and the cyclo range is one you should all be looking at. i will admit that i have been seriously tardy in my featuring of this great annual ride, this year leaving from st josephs academy in kilmarnock, ayrshire (saturday, october 25th), but i'm sure you know how it is, getting around to it always seems as far away as it was when i first thought of it. jez hastings anad i have partaken of the ayrshire roads for the past two years, and though we don't get out much, i'm not sure that it's possible to have this much fun and challenge on a bike on such a modest scale. two routes are provided for the hardy souls, one of around 70km, and a shorter one for families, children and those new to this cycling game, that flies in at around 32km. those of us who make up the proletariat of the cycling universe will be joined by such luminaries from the upper echelons as: scott sunderland, sean kelly, mark cavendish, david millar, chris hoy, graeme obree, brian smith (who's he? ), david harmon and anthony mccrossan. where else in the world could that happen? online entries close this coming friday (17th october), but you can turn up on the day and take a chance on there being spaces left. and talking of spaces left, much as i would implore you to join us at the evening's braveheart dinner, sadly (or rather, not sadly) it is completely sold out. so while you trawl round kilmarnock on saturday eve, looking for a fish and chip shop, those and such as those (including jez and i) will be supping with the stars and brian smith. if you can drag yourself out on the bike on the morning of the 25th, please join us for the braveheart ride and support this very worthwhile charity. lance did say it wasn't about the bike, but in this case it's all about the kids.